When it is feasible, I wind warps holding two threads. Winding two ends at a time means winding goes twice as quickly as winding one at a time. I prefer a 2 x 2 cross, especially when the yarns are textured, as in this warp. Textured yarns may tend to grab onto their neighbours and this can sometimes cause problems during beaming. This warp is two different yarns, both rayon, both 'wobbly', both textured, one more than the other. When winding a warp with a 2 x 2 cross, the ends must be kept together. If the loop is separated, this will prevent the cross from being transferred. With this warp at 16 epi, wound two at a time, I am using a four dent reed putting four ends per dent. If the warp was wider (this is a 'short' reed, plenty long enough for the 12" wide warp) and I had to use the longer 8 dent reed I would still put four ends per dent, but would then leave an empty one in order to achieve the spacing needed for the cloth. During threading I will be random in how they go into the heddles. I find this gives a more interesting look to the cloth as the threads do not alternate, but sometimes the ends might be side by side, or alternate. The only thing I do with this yarn is make sure the end in the outside heddle at the selvedge is the less textured of the two yarns because that one is stronger than the more textured one. This warp is another prototype warp. 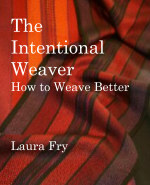 I will wind up with two scarves that I will weave with two different wefts. After wet finishing I will choose which weft I will put into production. While I'm pretty sure I know which one will be the 'best' weft, I won't know for sure until I get the scarves woven and wet finished. Sometimes you do need to do a 'full size' sample. Plus I need to weave down my stash, so I'm trying really hard to only work from my stash! I haven't had the chance to mix textures in a warp yet, so I'll be interested to see how this turns out.